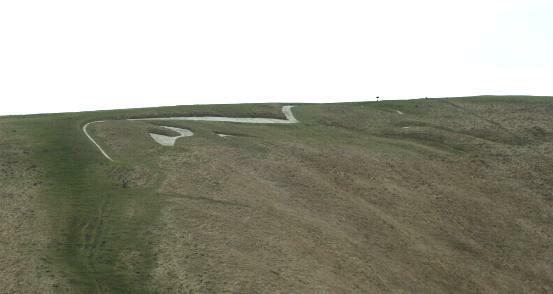 Uffington White Horse – Uffington, Oxfordshire. The white horse at Uffington dates to around 1000BC and sits amongst lofty company, close to Uffington Castle Iron Age Hill Fort and also to Waylands Smithy, a Bronze Age passage grave. The horse was dated to between 1400 – 600 BC by the Oxford University Reasearch Unit in 1995 using optical stimulated luminescence dating, it age is probably late Bronze Age. 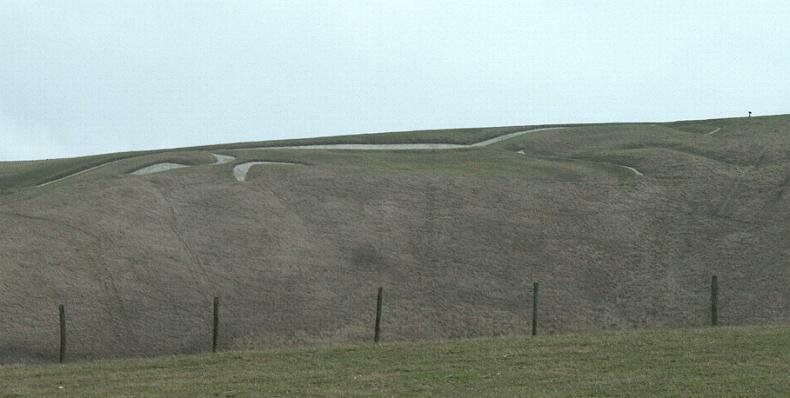 Uffington Horse is the largest hill figure in Britain, it is 110m long and 40m high. 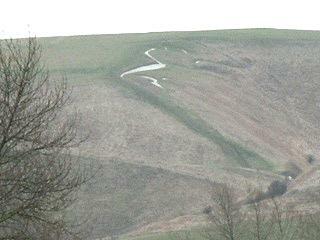 The horse is on the northwestern side of the Ridgeway, close by and is built on a Bronze AGe cultivation terrace. 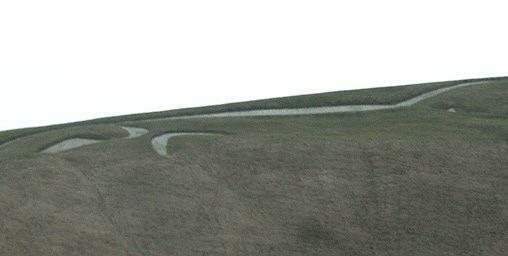 A bronze age long barrow lies between the horse and Uffington Castle, a modified hill – Dragon Hill is also related to the white horse, although it’s purpose is not known. 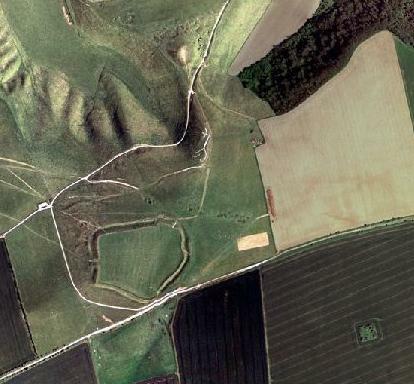 Multimap air phot of the white horse, which can be seen above the clear outline of Uffington Castle. David Miles and Simon Palmer did small excavations of the horse in the 1990’s, and were able to deduce that the horses shape has been largely unchanged over the centuries, although it was originally 1m wider. 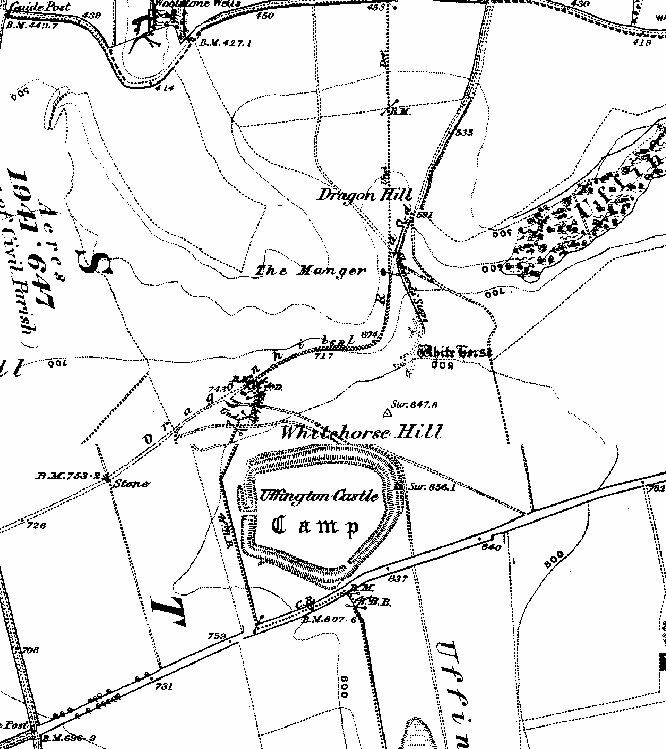 The white horse as shown on the 1850 OS map. 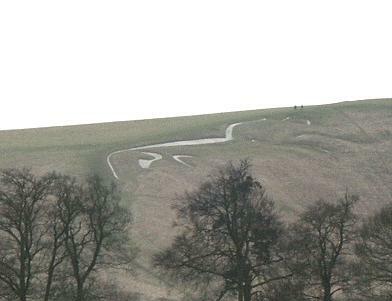 A key problem with the white horse is that it was apparently made to looked at from the sky. It’s location on the Bronaze Age cultivation terrace means that at 20 degrees, the viewing angle even from quite a distance is quite narrow, yet, it a were built just a few metres lower, the angle would reach 40 degrees and would have given a much clearer view from the ground. The view from Dragon hill obscures most of the horse, it is unlikely to have been a “viewing platform”.